The Bible Chapel Blog - Who is the Testimony of the Believer? 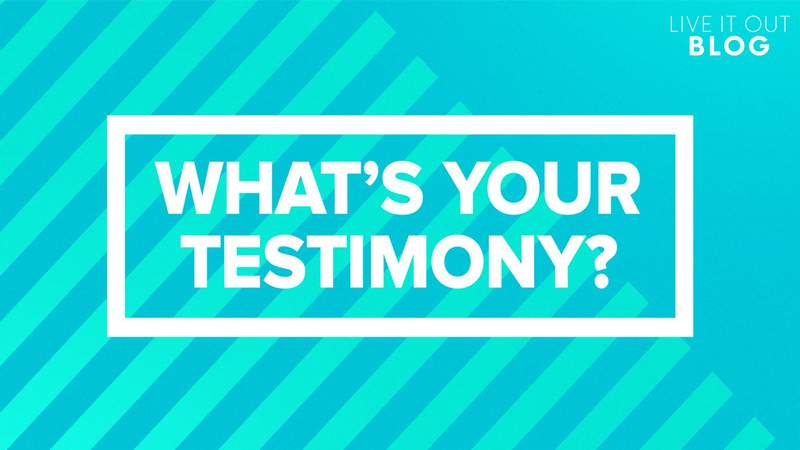 In the Christian life, the word “testimony” is used often. Pastors tell the congregation to share their testimony to the world. Guest speakers usually begin by sharing their testimony along with a photo of their picturesque family and pet dog. But do we actually know what to say when the time comes to share our testimonies? The picture that is going to be painted in this writing is for us to see that we all share the same testimony. Our testimony as believers is Jesus Christ: the One who writes our stories. 1 Peter 3:15 implores believers to “honor Christ the Lord as holy, always being prepared to make a defense to anyone who asks for a reason for the hope that is in you; yet do it with gentleness and respect.” It is my prayer that after reading this, you will feel encouraged and empowered to go and share your testimony with the lost and hurting world. I did not grow up in a Christian home. Due to that experience, my road leading to Jesus was different than many others’. My mom took us to church and dropped us off at the youth group, but nothing stuck with me as life-changing truth. It wasn’t until a friend invited me to church during my freshman year of high school that I finally became a believer in the saving power of Jesus Christ. At that moment, the trajectory for my life, in my eyes, was changed forever. Before Jesus, I hadn’t a clue on what I was going to do with my life, but after Jesus came into my life as Lord, my life was radically different. 2 Corinthians 5:17 became my favorite verse. In this verse, Paul shares the reality-shaking truth that “If anyone is in Christ, he is a new creation. The old has passed away; behold the new has come.” What this means is that in Christ, we are a new creation. Our old self was crucified with Him (Romans 6:6), and now our entire life is in Christ. If you are like me – not growing up in a Christian home and trusting in Jesus later in life, like all followers of Christ, we have the testimony that He came and took our sin upon Himself so that we can receive forgiveness and a new life in Him. I have heard it said before and have seen in actuality that those who came from Christian homes think that their testimony isn’t so great because of their upbringing. That is a lie. If you have experienced the sweet taste of the saving power of Jesus, then your testimony is as powerful as any other. At some point you like every other believer, came to a moment when you personally trusted in Jesus Christ as your Savior. You realized your parents’ faith doesn’t save you, only Jesus does and you trusted in Him. The Gospel is not limited by the kind of home life in which you were raised. I think of Paul’s upbringing when it comes to this. Paul, who grew up as a Hebrew, was trained by Rabbi Gamaliel. The Holman Bible Dictionary describes Gamaliel as one of the most renowned Jewish Rabbis for his high moral standards and his interpretation of the Scriptures. This was Paul’s teacher, and yet he was still a sinner in need of grace! Those who grew up in a Christian home have the same testimony as those who grew up in a non-Christian home. Their testimony is that Jesus Christ came and took their sin upon Himself so that they could receive forgiveness and a new life in Him, and they personally have trusted in Him as their Lord and Savior. I would be naïve if I thought that there wasn’t someone in everyone’s life that doesn’t know Jesus as their personal Savior. We pray for those who do not know Christ because they have not experienced the chain lifting freedom that Jesus offers. They are enslaved in their sin. We feel a desperate desire to see the Gospel of Jesus Christ intervene and radically change their lives. The hope for them is not found in earthly things, but in the Creator of life. It is my prayer that when you are finished reading this, that you would have the same mindset that the author of Psalm 66 had when he said, “Come and hear, all you who fear God, and I will tell you what He has done for my soul.” There is an invitation in that verse. We are called to invite those that come into our lives to hear the good news of the Gospel. Our testimony for all of eternity will be Jesus, and we are called to share this testimony with everyone we encounter. The writers in the Bible understood that the Gospel was and is the greatest news ever to be shared. Whether we grew up in a Christian home or not, if we proclaim Jesus as our Savior we share the same testimony. We share the truth that the King of Kings came and dwelt among us to take our sin upon Himself to give us life and reconciliation. It is this testimony that we get to share and live. May this be an encouragement and challenge for all of us to go and share this good news with everyone.